Catalonia has won, after three finals against Argentina, the 2010 Copa America. The Catalans, who missed the last final with a golden goal in extra time, have scored soon with a goal by Torra in 6th minute. The albiceleste team has atacked hard with disagreements between several players, as Ábalos with Gual and Ariel Romero with Titi Roca. The players coached by Jordi Camps have not come into this game and have spent their time to play the ball to achieve the second goal, that has been scored by Titi Roca. In the second half, the game was the same, until at 10th minut Panadero has established the final 3 to 0 with a fantastic goal, leaving the goalkeeper sitting. Sergi Fernandez has shown why is one of the best goalkeepers in the world, making good keeps. 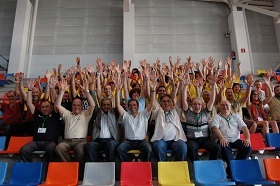 Catalans have always had the support of fans till the final of the match. 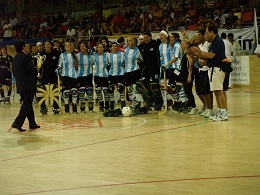 Argentina was proclaimed champion of the 2010 Copa America International Open. During the first twenty minutes, the chances have been clearer for the Catalan team. Carla Giudicci had the first in the 9th minute, but the ball has touched the two poles to finish out. The Argentinian team has been playing the ball but has generated no danger, until an innocent shot of Daiana Silva without any intention to go to goal finished in goal. Catalonia has come to win in the second half but a goal of Argentina seven minutes of the restart gave bad feelings to Catalans. A free kick scored by Carla Giudicci at minute twenty-eight has returned the encourage to the Catalan players. A nervous and tense atmosphere and very cheering fans have pushed the Catalan to fight till the end. Unfortunately for Catalonia, despite having to tie close, could not have won Argentina, that won with an adjusted 1 to 2. The youth teams of CP Vic have been the protagonists of the halftimes of the matches in the Copa America 2010. Coached by Pep Torras, boys and girls of 4, 5 and 6 years old have played several matches that have captured the attention of audiences and teams participating in the Copa America. The youth hockey of CP Vic will have next season 24 teams competing. Five of these teams will play the Osona County Championship for players of five and six years. They will have four teams in this competition for boys and one for girls. Youth CP Vic hockey is directed by Gerard Pujol and Joan Urban, and has about 250 players. 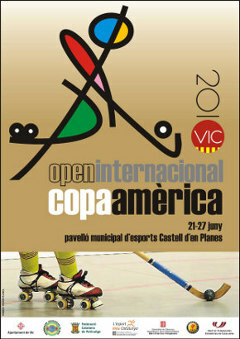 110 volunteers have made possible the brilliant organization of the 2010 Copa America International Open in Vic. 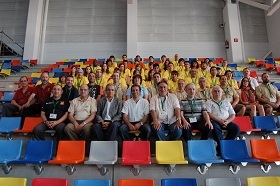 The entire week of competition, the 18 teams participating and the organization had the support of volunteers from the city of Vic and the Osona county. Among all the volunteers there were students from the University of Vic, people from CP Vic and representatives of volunteer service of the City Council of Vic. The volunteers in this Copa America has collaborated in the 25 areas of work. The coordination of all human group has gone by Lluís Tolray during the days of competition. 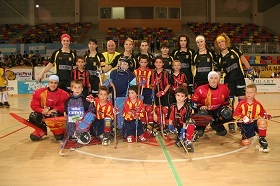 The preparation from the Catalan Roller Sports Federation was made by Jordi Diaz and from the Council of Vic Cristina Uriel. Brazil has won easily Chile, which has not been lucky in front of goal, missing three penalties and two free kicks. The Brazilians have gone ahead in the scoring ten minutes from the beginning and have been trying to score more goals until the last seconds to get a large win. Jurandyr da Silva “Didi”, has scored two more goals, becoming the competition's top scorer with 16 goals. 9 FM also bradcasts both finals -men and women- on the radio. [Link to El 9 FM in internet]. Chile has won Germany 3 to 1 in a very even match, reaching third place in the podium of the Copa America 2010. 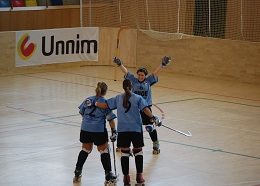 Today the German scorer Maren Wichardt Maren has not been successful and the German team has missed their goals. Moreover Fernanda Urrea has continued upward, adding two more goals to her own particular, reaching the figure of 15 goals and becoming the top scorer of the championship until the final is played. Brazil has won the United States in a balanced match where the transformation of two free kicks by the Brazilian has given them an important advantage for the last minutes of the game. 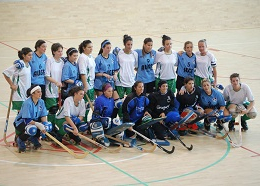 In this morning's first game, Uruguay has won a match that had begun losing to South Africa. It has been an exciting game, as the Uruguayan player Pucheta scored the goal of victory 23 seconds before the end of match. Uruguay say goodbye to the competition with a won match to reach the seventh place in the Copa America 2010. For the second time today we can enjoy a game between Argentina and Chile and in both times the winners were Argentina. It has not been easy for Argentina because the Chileans have insisted, but have not been lucky with the goal. As the minutes passed they have lost force, and the Argentines have increased the difference. 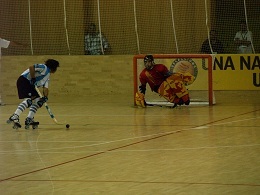 The last minutes of the game were frantic with chances at both goals with good stops by the two goalkeepers.